Cree Village Eco Lodge is a 21st-century facility that honours our ancestral past. The entire building blends subtle cultural elements with environmentally advanced design and operations through energy efficient construction and systems. We use natural fibres and materials throughout the building. We offer a 20-room facility featuring 17 Deluxe Rooms, one Author’s Suite, one Conference Suite, and one Jacuzzi Suite. The main architectural feature of the Eco Lodge is the Great Hall. 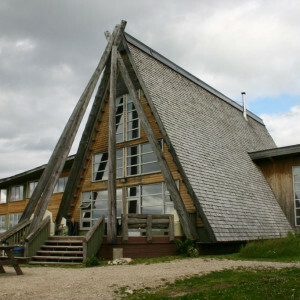 This is the lodge’s main gathering place and it is modeled on a traditional Cree dwelling called a “Shaapuhtuwaan,” which literally translates to “long teepee with doors at each end.” These are made by erecting two sets of teepee poles and extending a ridge pole between the two tops. Dining in the Shaapuhtuwaan’s immense pine and cedar structure overlooking the grandeur of the Moose River provides a truly awe inspiring experience that offers views of magnificent sunsets, and our striking night skies. In 1996 our community decided to pursue an Eco Lodge project in order to advance the development of indigenous tourism in our region, and to provide new economic benefits for our people. Cree Village Eco Lodge is situated in Moose Factory, Ontario, an island community located between the shores of the Moose River near where the Moose River meets the ocean waters of James Bay. Here in the heart of the Hudson Bay watershed, Cree people have subsisted for millennia.